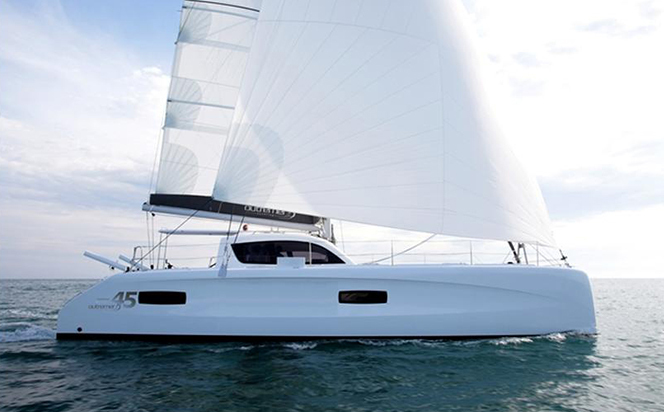 Like earlier models in the range, the French multihull is designed to blend speed with comfortable accommodation. While it may not have as much interior volume of other designs of this length, this is offset against improvements in the boat’s sailing abilities. The design team includes Barreau-Neuman for the naval architecture, Franck Darnet Design for the design, and Patrick le Quement, who was responsible for the overall cohesiveness. From a performance perspective, the hull shape below the waterline is optimised for minimum frictional resistance, while the weight of the structure and systems has both been minimized and carefully distributed. The mast is positioned for excellent performance and sail handling – rather than increasing accommodation space, while there are optional tillers for greater steering control and dagger-boards for improved windward sailing efficiency. The 45 is specifically designed for long distance sailing by couples or families. 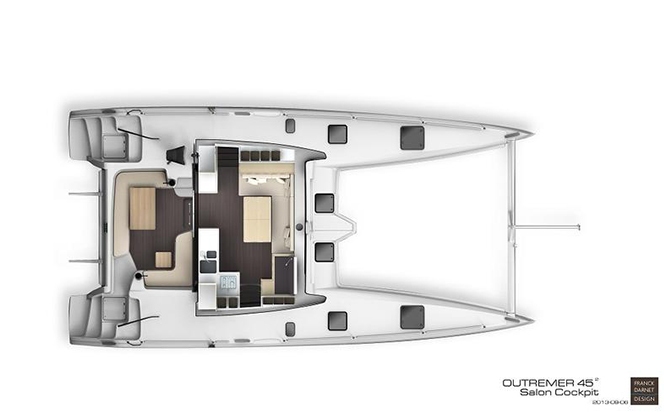 From the perspective of seaworthiness, the new design offers a wide, uncluttered cockpit for efficient sailing, plus an exceptional view of the sea from the cockpit, cabins, and main saloon. For safety, the protected helm station is positioned within easy reach of the mainsail and headsail sheets, while the forward-facing navigation station enables effective watch-keeping from below decks. In addition, a generous bridge deck clearance of 0.8m minimises slamming from waves in large seas. 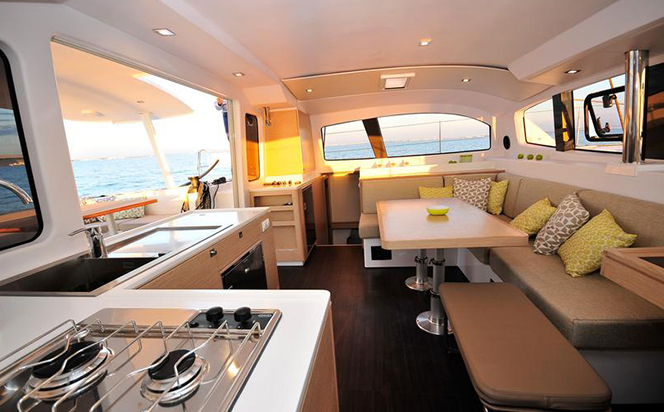 Below decks there’s also a comfortable and refined saloon that’s ideal for entertaining. This area opens out expansively onto the cockpit and includes an ergonomic galley that faces the cockpit. Stowage space, both internally and externally has been maximized to ensure sufficient room for provisions, on-board entertainment and sports equipment. Accommodation layouts include a four cabin, two heads standard arrangement, or an owner’s option that has the entire starboard hull given over to the master suite.